I met Ted Corbitt in 1984 when I was sent to the ICD (International Center for the Disabled) for rehabilitation following orthopedic surgery. I knew nothing of his Olympic history or track records, only that he was Chief of Physical Therapy at this esteemed institution. It soon became apparent that he had a remarkably unusual character. Touch being his medium, Corbitt spoke very little, taking notably meticulous care with his patients, many of whom had severe handicaps. Always concentrating intensely, he was completely and quietly consumed with exploring the most effective treatments for each one. He often worked through asthmatic stress, spent extra hours and days off helping colleagues and clients, and continues to do the same although retired. His life is a scholarly, spiritual pursuit of the knowledge of healing and human excellence. Ted Corbitt left us early this morning. Do your best today in tribute to an amazing, incomparable man who never did less than that…every day and always. His range of expertness in therapeutic exercise approaches is extraordinary and he masters not only the theoretical bases but becomes an outstanding demonstrate of the technique. He has functioned as a faculty member for all the physical therapy programs in the New York City area and has taught clinical workshops on topics ranging from connective tissue massage to neurophysiological approaches to therapeutic exercise for stroke victims. To watch Ted Corbitt when he is treating a patient and demonstrating a clinical approach is an aesthetic experience as he moves with such grace and ease. 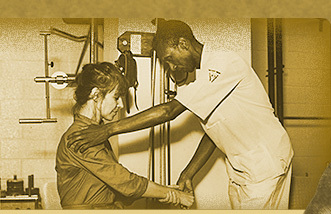 He is the most important illustration of a selfless servant of the disabled through direct hands on therapy that has also been transmitted to countless number of clinical therapist throughout the United States. 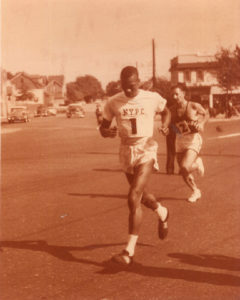 Besides being an African American Olympic marathoner in 1952, a time when marathon running was far from integrated, Ted Corbitt was the quiet, tireless founder of the measurement and course certification system which allows millions of runners today to know that the courses they run -- be it the Boston Marathon or their local Turkey Trot 5K -- have been accurately measured. This is his remarkable and enduring legacy. I first encountered Ted Corbitt on March 19, 1969 at McComb’s Dam Park near Yankee Stadium in New York at the first turn-around in the Cherry Tree Marathon. I had just turned twenty and as a college track guy ran full of myself and well ahead of whom I perceived to be an old man running in great pain. I thought to myself that they really should not let old men suffer so much by letting them run marathons. I thought that the poor old guy would never make it. I did not think of him again until the final miles when I staggered along and looked back to see the old guy with the same pained face gaining on me. It took everything I had to stay ahead of him finishing in 2:42 as I gained everlasting respect for old guys and the value of toughness and longevity in our sport that has served me well since. So I owe Ted Corbitt for scaring sense and respect into me. I am the editor of the Polarity Therapy Newsletter “Energy” produced by The American Polarity Therapy Association. I knew Ted casually for about twenty years and for a short time he took classes with me in the late 1970s and early 1980s. He was one of the most humble people I have ever met. Soft spoken, secure, mild mannered. All he ever told me was he was an ultra-marathoner. Nothing about awards, founding New York Road Runners Club. I had no clue of his accomplishments until I read the obituary in the New York Times. Now I know what humble really looks like. Ted Corbitt was such an amazing man. He said little, yet when you were with him somehow you knew you were in the presence of true greatness. There seem to be vibrations an unspoken language that on very rare occasion communicates a truth of such depth that words could not express it. Ted Corbitt was a great runner, but I have met many great runners. He is much more than that, he was great human being. I have met very few of them. I pride myself in having known. Whenever I face a big challenge, I always think of how Ted would face it. This gives me quiet strength. I am so fortunate to have known him as a mentor and friend. *I will be relaxed and free of all restrictions, free of all coordination tensions in running. *I will feel buoyant and strong while running. *I will run in a perfect pacing coordination form. *I will be at ease during the morning of a/the race and my pulse will not accelerate before or during the pre-race physical examination. *I will run hard and enjoy the effort. *My gastro-intestinal system will remain normal in function on the day of a race and especially during a race. *On the day of a race all body organs will function perfectly, especially the heart and digestive systems. Though death’s come up on the inside lane. Never lay your body down. Let us see your serenest of smiles. and marvel at your workman’s gait. Once more around the track. Healer with the gentle laugh. May we run with you? As you beat the sound of your humanity. Who says we can’t run the distance? You did for 88 years. Who says pain is an obstacle? Once more around the Olympic track. So may we carry your torch. May we cheer your name, Ted? Once more around the track? Forgive us if we lay your body down. The Jackie Robinson of Long Distance Running. That’s why they call him champ.